We're moving again! Well, not physically, but my blogger account is full, and I'm moving to a new blog location. CLICK HERE TO ENTER MY NEW SITE!!! 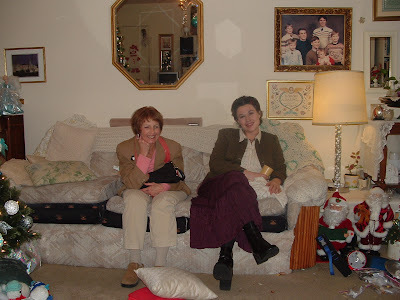 Here's Aunt Eleanor and me! She's so much fun! It was the first time that we'd met. And Brent hadn't seen her in ages either. She's such as great lady. Definately on my list of favorite people! For the title, I used RC Mama's Sweet Daisey kit, and WordArt by ME! I recently discovered the art of DigiScrapping, and must say. I'm hooked. I don't know enough about Photoshop to do anything really neat, but I did figure out WordArt. I LOVE it. And, since my family is getting a little tired of it, I decided to make a different site entirely for the word art. Follow the link below to see my "beautiful" creations. Enjoy!!! Can't wait? Watch Jerico Season 2 (epis. 1,2,3)now!!! Sometime I Just Like To Do This!